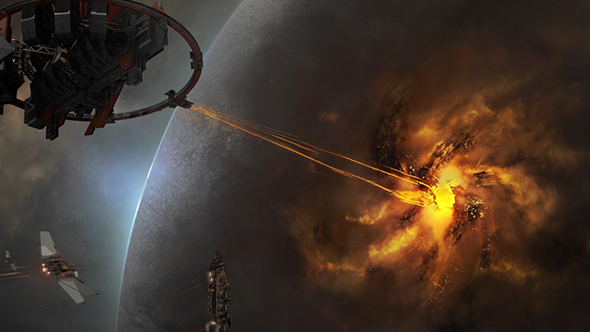 Part space MMO and part corporate espionage simulator, Eve Online has served through the years as a pretty stunning example of what a fully-fledged digital economy can look like. The latest expansion is titled Lifeblood, and it’s all about new ways to mine moons and improve your resource gathering workflow. And, if that wasn’t exciting enough, there are pirates. Looking to dive into Eve for yourself? Check out our Beginner’s Guide. Lifeblood’s headline feature comes in the form of Refineries, a new class of structures set to expand and streamline the mining process, making a far more efficient path to extract, refine, and process incoming materials. That turns moon mining from a passive income source to an active bit of gameplay, pushing players into situations where they’ll either need to work together or kill one another for fun and profit. Pirate fleets are moving in to take advantage of that increased conflict, too. New rogue Forward Operating Bases will be popping up across New Eden, hosting scallywags who hope to swoop in and steal those dwindling resources while the other factions fight over them. Naturally, that means bounty hunting opportunities for players looking to make their fortune with guns. The update will also see the addition of new UI and interface changes (essential stuff when you’ve got new bits of income to track in your ledgers) and balance changes for Alpha ships giving them a bit more punch and tactical versatility. You can check out further details on the official site. Lifeblood will be released October 24.